Get your alarms set! Wednesday morning you have the chance to see a super blue blood moon eclipse. This is the first time a super blue moon has coincided with a lunar eclipse in over 150 years. Super, or supermoon, is when a full moon is at the closest point of the moon's orbit with Earth. In other words, the moon looks a lot bigger than normal. NASA predicts that this supermoon will be 14% brighter than usual. Blue refers to the second full moon in a calendar month. The first supermoon of 2018 took place on New Years Day. Lastly, the "blood moon eclipse" occurs during a lunar eclipse. The black shadow from earth will begin to cover the moon, but instead of going completely dark, faint red sunbeams peek out around the edges of the moon, giving it a blood orange color. 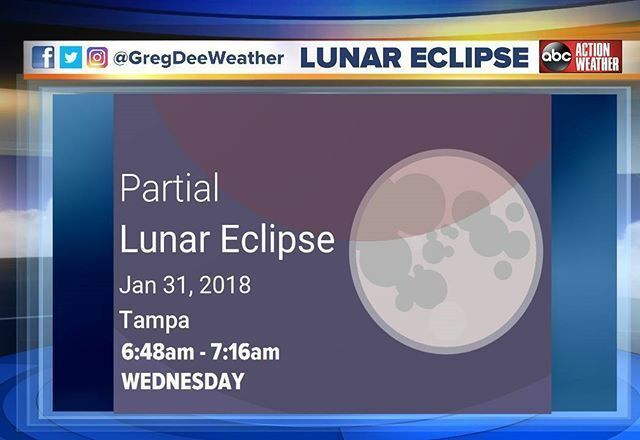 Unfortunately, Tampa Bay will not be able to see a total eclipse. The total eclipse will only be visible from the West Coast and part of the Midwest. The reason that Florida will not get to experience the phenomenon is that by the time it would be viewable across the state, it will be nearly 7 a.m. when the moon sets and the sun begins to rise. NASA will stream the super blue blood moon live.